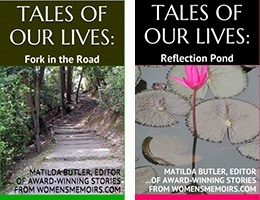 I wrote a chapter in the anthology, Tales of Our Lives: Fork In The Road. Please read it and send me your comments. Hope you enjoy! We must have been no more than nine years old, my best friend Debbie and I. We shared a magnetic attraction to things yet to be discovered, to mysteries and exploring the unknown. One of our favorite TV shows, in fact, was called The Unknown that creeped us out with strange outer-space creatures and dark, freaky imagery that gave me nightmares but nevertheless I could not stop watching. My attraction to the impenetrable was nurtured by years of reading the Bobbsey Twins books, where children just like us would mark their passage through time by exploring the clues to secrets, secrets inevitably resolved by the discovery of valuables or documents or cherished jewels hidden away somewhere in an attic or fallout shelter or behind a false door. The Bobbseys’ adventures were by today’s standards quite tame, and perhaps that’s why they had such enduring appeal. My day-to-day suburban life felt secure to the point of boredom, and if other ‘normal’ kids could experience such excitement while on a trip to the beach or visiting their cousins or hanging out near their house, there was hope that an adventure was waiting for me around the corner. It was the clues, I think that I was drawn to more than discovering any actual buried treasure. Thus, Debbie and took on the role of neighborhood detectives, and everyone we encountered was hiding something, and up every driveway lived a person of interest. That yellow car that always turned the corner of our street at about the same time every day. The little man with the floppy hat and the button-down olive-green sweater, boring down in a fast walk and never looking up during his afternoon constitutional, as if being chased and up to no good. The gray-haired woman in the blue dress, her face caked in powdery white makeup and deep-red lipstick, holding tight to her black purse, obviously bewitched, intent on getting to her destination. The kid who rode his bike in endless circles, round and round, never saying a word. Debbie and I formed our own two-person club whose sole purpose was to keep secrets and regard every person with suspicion. And then there was that old burned-out house where all that remained was a piece of brick wall and a chimney. We called ourselves The Mystery Club, and regularly met behind the brick wall to discuss our investigative work, sharing the diaries we kept containing detailed notes about our observations. Since clues were scarce and buried treasure was not imminent, we decide to bury our own treasure. In a cardboard box, we carefully laid our diaries and trinkets we had picked up in our travels up and down our adjoining streets. We agreed that the best, most protective place to keep our cardboard box safe was deep in the ground behind the brick wall near the burned-out chimney. Surely, our box would there be preserved forever. I remember the musty, damp, earthy smell of the dirt, when, weeks later, we dug up our Mystery Club box to ensure it had not been tampered with by any untoward persons. We had not counted on the wetness of Georgia red clay during that typically hot, humid summer. Still, what remained of the box was in the ground where we had buried it, and there lay our diaries, most pages unreadable. The questioning, I realized much later, was an expression of what would become the energizing force of my spirit. My essential desire was to understand life and people and grasp the metaphysical “reasons why” of the universe. Why am I here? What is my relation to the world? What gives meaning to existence?